Put Number - Relaxing tile puzzle comes from TAKASHI TOKUDA. I confess, I saw the images and didn't think I'd like it. However, Japanese puzzle designers usually produce fun, innovative puzzles of all types. So I downloaded it. Put Number's object is to score points. The second image shows the rules for collecting certain numbers. However, you can collect, six 4's if that happens. Initially, the board is empty and you are given 3 sets of double tiles. Place them on the board wherever you like. Then 3 more sets of double tiles will be given to you. 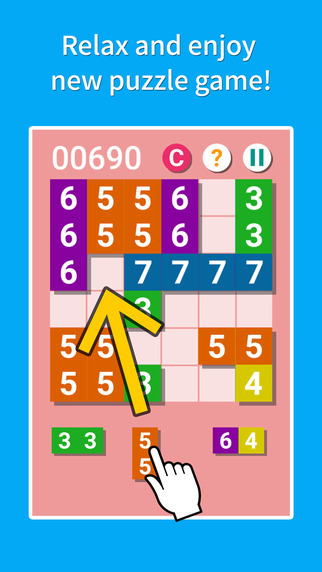 Next to your score - there's a letter C. That stands for clearing the board of a specific number. This button cannot be used frequently. More like 2 or 3 times per game. My high score is 4357, which places me second in the world out of 1182 other people. (My parents don't care.) (Also: congrats to Alewyn Burger for being first at 4887.) On that particular game I used the C about 8 times. I believe that for every 500 points scored, you get one C. But I have not verified that. One of the good things about Put Number is that even though it's an 'endless' point scoring game, it goes pretty fast. I really like Put Number and believe it's a contender for a PAGY award.